My husband seems to get sore hands and wrists a lot from working with hand tools, and in the past has used products like Icy Hot or Bengay. 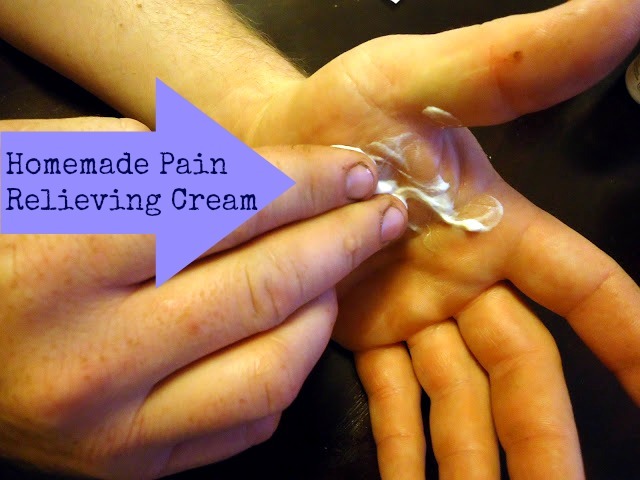 He asked me a while ago if I thought there was something I could make to help him out; and so, not wanting to let my red-hot, sweet-lover down, I went on a mission to create a cream that would help to relieve some of his aches and pains. I did some digging around online to find out what the active ingredients in most pain relieving creams are, and there were three in particular that kept popping up: menthol, camphor, and methyl salicylate. The menthol and camphor were pretty easy to find--the menthol can be purchased in the form of menthol crystals and camphor essential oil is widely available. You may be able to find these two ingredients at your local grocery store or pharmacy, but if not, there are plenty of places online that sell them for a reasonable price. As for the methyl silicylate, I wasn't sure where I would get that--it is "an organic ester that is naturally produced by many species of plants," according to Wikipedia. But that got me thinking about which plants produce it, so I did some research, and found that Meadowsweet is an excellent source of this ester. Hence, the inclusion of dried meadowsweet in this recipe. You can purchase meadowsweet online, but if you grow your own or know of a good source to harvest wild meadowsweet, that's even better. The day before you make the cream, you will need to infuse the almond oil with the menthol crystals. Mix the oil and crystals in a jar, and allow to steep for 24 hours, shaking occasionally, until the crystals have dissolved. You will also need to prepare an infusion with the meadowsweet and water. Heat the water to boiling and pour over the meadowsweet in a heat proof container. Cover and steep while you are infusing the oil. The next day, place the infused oil, beeswax, coconut oil, and cocoa butter in a small pan and melt over low heat. Remove from heat, and allow to cool to about body temperature. Meanwhile, strain the meadowsweet out of the water. You will need 9 tablespoons of infused water, so if you don't have quite enough, just add a little plain water to get it back up to 9 tablespoons. Place the water in another small pan, along with the vegetable glycerin and heat until warm. Stir in the borax. When both solutions have cooled to body temperature, pour the oils into a blender. Remove the lid's plastic piece so that you can drizzle the water solution into the blender. Turn the blender on low, and slowly drizzle the water solution in. It should begin to form a cream rather quickly. Blend for 10 seconds. Add the camphor essential oil and blend another 10 seconds. Scrape the cream into the container you'd like to use. It will keep about a month at room temperature, but if you keep it in the refrigerator, it will store for 6 months or longer, and will also keep a more pleasant texture and consistency. -Menthol crystals are quite strong. The fumes from the warmed oil may irritate your throat and lungs, so try not to breathe it in. You may also want to wear safety glasses while you are making this--if the menthol gets in your eyes, it will hurt. Don't ask how I know. -If your mixture isn't turning into a cream in the blender, it is probably still too warm. Put it in the refrigerator for a couple minutes, and try blending again. Repeat as necessary, but if all else fails, pour the mixture into your container and refrigerate overnight. By morning, it should be set up. -My husband says it feels a bit different than Icy Hot, but it still works well. I have been having some soreness in my knees now that I'm pregnant, so I'll be testing it myself soon. -I hope my instructions are clear and easy to understand, but if you have any questions, please let me know in the comments section below. Some over the counter pain creams contain capsicum (Red pepper), so you might try that. Methyl Salicilate is a dangerous ingredient on which at least one death (teenaged track star) has been blamed. The methyl salicilate is present in the herb meadowsweet, which is safe to use, especially externally. Yeah, I did mean that had you been able to obtain the pharmaceutical type ingredient it could be dangerous. Any how, you might want to try the capsicum. It is the main ingredient is Capsaicin cream. I will have to give it a try, thanks! Anything is dangerous if it is abused and taken in excess. Vitamins, minerals, asprin, etc. are all safe when taken in moderation. Dangerous when taken in excessive amounts. The track teen of Stanton Island was using four different products that contained methyl salicylate at once. As a result she got an over dose of methyl salicylate and ended up dying. When used as directed and in moderation, these products are quite safe to use. I would like to know if the menthols crystals can dissolved in water (hot maybe) for using in a spray bottle ? I want to try this but, what does the borax do for the cream? I think it would be good for bursitis? I fully appreciate your site post. Your post offered me some amazing information . Camphor oil is one of the most demanded oil all across the world as it can be utilized for curing several ailments. Would arnica flowers be a good addition into this? I've used arnica gel in the past for sore muscles and bruising. Wouldn't wintergreen essential oil be a good replacement for the Meadowsweet? It also contains methyl salicylate and has the benefit of smelling great. I've tried wintergreen essential oil. It appears to contain small amounts of methyl salicylate and it is not as strong as what is used in icy hot. Why do you use Borax? I think that is poisonous to take into our bodies.